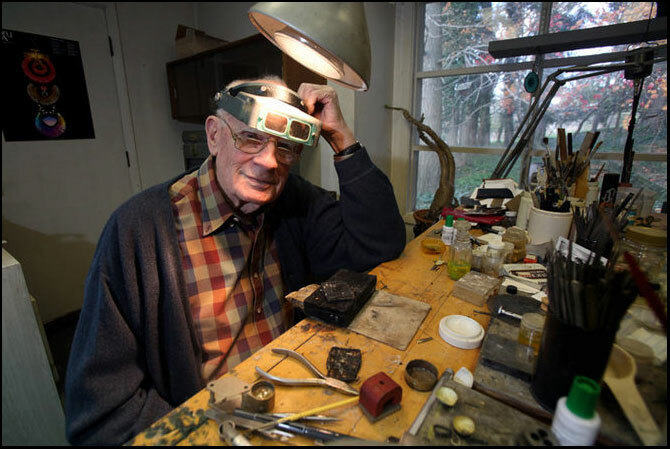 I was profoundly saddened to read yesterday morning that one of the revered masters of goldsmithing and my personal hero, John Paul Miller died over the weekend. He was single-handedly responsible for revitalizing the ancient art of granulation in the 20th Century. Not only has he left behind an astounding body of work, he passed on his knowledge by teaching for over 40 years at the Cleveland Institute of Art. His contributions and innovations to this lost (at the time) art form are incalculable to the generations of goldsmiths that have come after him. 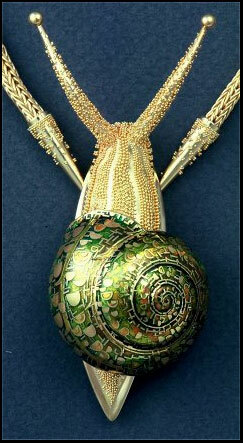 Instead of replicating Classical pieces from the ancient Greeks and Etruscans like the Victorian goldsmiths had done before him, John Paul Miller created fantastical three-dimensional creatures embellished with not only spherical granules, but small geometric shapes and then proceeded to enamel on portions of the pieces. His pieces are so astonishing that even if you don’t understand how technically difficult they are, you are bound to be entranced by their sheer beauty. I’ve included several examples of his work here, but if his work captures your imagination, a google image search is definitely worth your time. My first encounter with Mr. Miller’s work came during college. My professor, Jon Havener, was a student of and later taught with Mr. Miller at the Cleveland Institute of Art. Jon taught a metalsmithing class during my sophomore year called Seminar, where we delved into a variety of techniques including granulation. He used images of Mr. Miller’s work to inspire us and most importantly, demonstrated his technique for getting those little tiny spheres to adhere to a much bigger piece of sheet. This, I was to find out, was incredibly difficult and my first finished piece probably had only about a quarter of the granulation design actually fused in place. 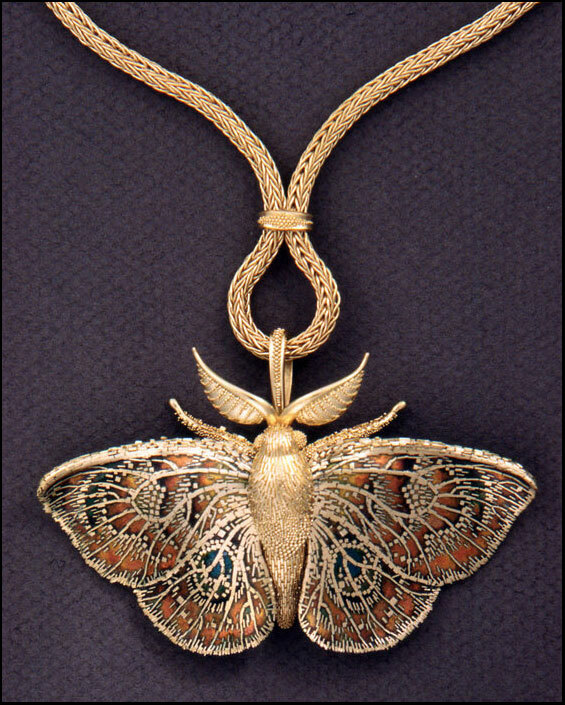 While my later study abroad experience in Florence, Italy cemented my love of granulation, it has always been John Paul Miller’s work that is the benchmark by which everything else is judged. It was his demonstration article in the bible of jewelry making, Oppi Untracht’s Jewelry: Concepts and Technology, that helped and sustained me through my first goldsmithing job. To this day, the 800+ page book will fall open to his page. A number of years ago at an art fair, a woman was admiring our work and said it reminded her of Mr. Miller’s. I was flattered of course, but also surprised and pleased to talk with someone outside of esoteric jewelry circles who knew of him. She then said that she had one of his pendants and she would wear it to the show the next day for us to see. Needless to say, to hold and examine one of his works of art was something I’ll never forget. 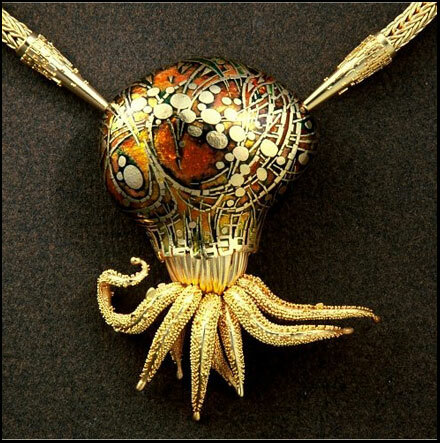 To quote the Cleveland Plain Dealer’s obituary on Sunday: “Miller’s exquisitely designed and crafted brooches, pendants and rings have been compared to masterworks of Rene Lalique and Louis Comfort Tiffany”. Like those artists, his work will transcend time. John Paul Miller will be sorely missed.